Recipe from Baci Trattoria in Salt Lake City. Place bacon or ham in a heavy saute pan over medium heat. Cook bacon until crisp, ham until hot, adding minced garlic about 30 seconds before the meat has finished cooking. Add cream and peas and cook at a slow rolling boil for four minutes. Set aside. Fill heavy stock pot with half-gallon of salted water. Bring to a boil. 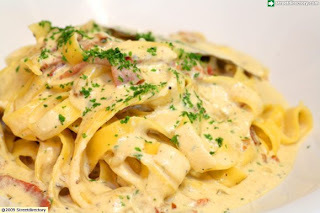 Add dry fettuccine and cook for 8-10 minutes or cook fresh fettuccine for 3-4 minutes. Drain and rinse well with cold water. 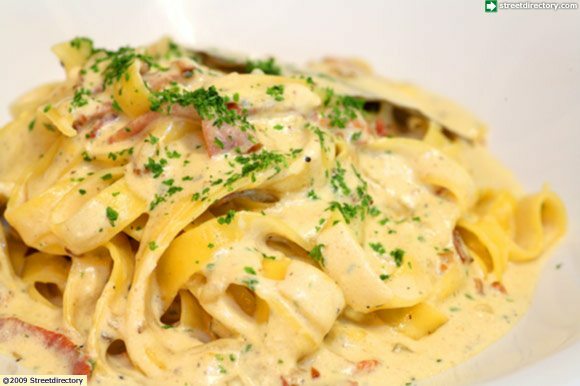 Toss fettuccine with cream mixture, then add Parmesan cheese. Garnish with parsley and serve.